马年快乐! 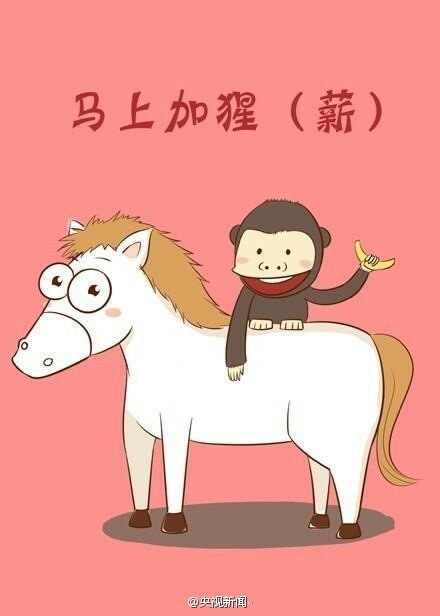 Happy Chinese New Year of the Horse! Chinese New Year of the Horse: Traditional or modern? Or, if you want something more trendy, pick a greeting from the currently very popular “马上” series! 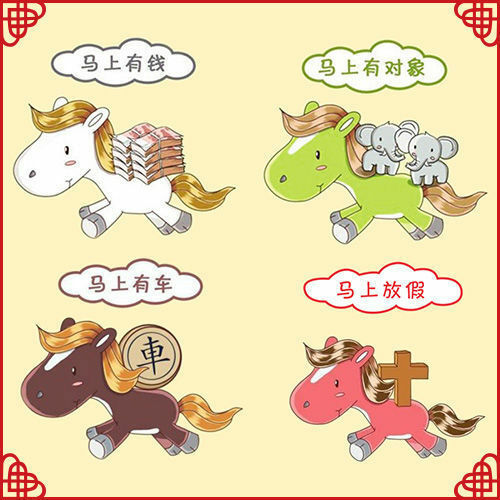 This series of greetings all play with the fact “马上” both literally means “on a horse” and ”immediately”! The idea is to place what you’re wishing for, on a horse to make it happen during the year of the horse ! And if there’s a play on similar sounding words, it’s even better! Sounds strange? 加猩 jiā xīng is really close in sound to 加薪 Jiā xīn, which means “to raise salary! So you’re actually wishing someone an payrise this year! Wondering what to eat for the Chinese New Year? One word: dumplings! Not sure how to celebrate? Here’s all you need to know! Enjoy the Chinese New Year!